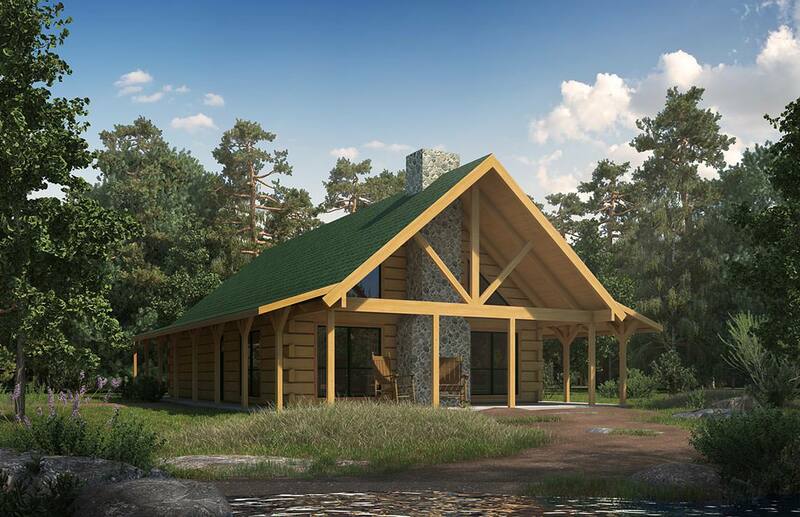 It might seem sentimental to name log home cabin floor plans for grandchildren, but the first thing anyone will learn about Satterwhite Log Homes is the perfect truth in our slogan, "Our Family Serving Your Family." Cason's Crossing is among the first of our plans to cross the thousand sq ft threshold. With a main floor of 1,092 sq ft, and a finished loft space of 228 sq ft. Cason's Crossing is a truly livable plan, perfect for empty nesters, and suitable for an occasional invasion of your own grandchildren! In particular, the master suite is comfortably sized, and the addition of a half bath is wonderful for visiting family and friends. The island bar integrates the kitchen into the family room, keeping the entire family connected, and the vaulted ceiling and prominent fireplace focus the entire space. Large picture windows frame the fireplace, great for looking out year round, and perfect for a Christmas tree in the holiday season. Outside, a gable porch adds a lot of curb appeal for a home most people would never consider building anywhere near a curb.